Unresolved IT issues can escalate and turn into large problems that can interfere with your company’s scheduled operations, causing you to fall behind, damaging your productivity, credibility, and bottom line. Total Computing Solutions understands this, and that’s why we work to ensure that any problems our clients face are addressed quickly and efficiently, just as if they were our own. Once you contact Total Computing Solutions, the receiving technician will enter the job into our service management software and document all the important details provided. Based on a priority assessment, we will schedule a time to begin working on your problem. Our priority assessment considers the severity of the incident, our current service schedule, and whether or not priority service has been requested. A technician will begin working on the issue at the scheduled time or sooner if possible and will contact you to discuss the issue via phone or e-mail. The majority of issues can be resolved remotely, however, a technician can be sent on-site if necessary. This is a major advantage of working with a local IT company such as Total Computing Solutions, as not all problems can be resolved remotely and typically, it is the most serious ones that require on-site intervention. It is very important to us that you are satisfied with our service. We keep you up to date via phone and/or e-mail throughout the service process. You are free to call us at (920) 569-2681 or e-mail us at service@tcsdepere.com at any time to request an update. Don’t get left waiting around for IT support. 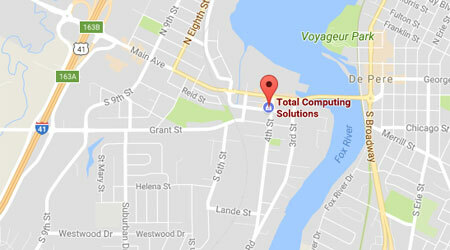 Get the support your company needs, when it needs it, by partnering with Total Computing Solutions. For more information on our support process or any of our other services, reach out to us at (920) 569-2681 or send an e-mail to service@tcsdepere.com to speak with a member of our team today.